Iran’s authorities have finally confirmed the additional sentence imposed on prominent human rights lawyer Nasrin Sotoudeh, setting it at 26 years and 148 lashes. The official verdict was published after a week of contradictory statements over the punishment of Sotoudeh for representing protesters and women demonstrating against compulsory hijab. Sotoudeh’s husband Reza Khandan — who is facing a six-year sentence as part of the regime pressure on the lawyer — initially said the human rights activists was given another 33 years on top of the five-year term she is serving. He later amended this to an effective 10-year addition, indicating sentences on multiple charges were concurrent. Meanwhile, an Iranian official announced that the additional sentence was seven years. Sotoudeh was imprisoned from 2010 to 2013 for her representation of those demonstrating against the disputed 2009 Presidential election. She was arrested again in June 2018, after she insisted on defending women who publicly took off their hijabs and waved them on the end of poles, in Tehran and other Iranian cities. 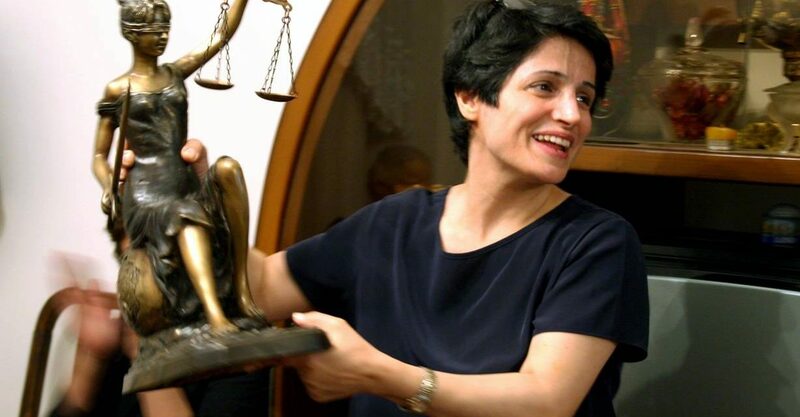 Sotoudeh has refused to back down from her right to defend others, leading the authorities to suspend visits with her children and to arrest and sentence Khandan, who is free on bail. The official verdict converts her legal activity into “national security” charges and manufactures new allegations: “gathering and collusion against national security, propaganda activities against the regime, active membership in an illegal group acting against the regime’s security, encouraging people to corruption and prostitution and providing their means, disturbing public order and peace, spreading falsehoods to mislead the public mind, [and] appearing without hijab before the examining magistrate”. The document tips off the motive behind the prosecution of Sotoudeh — “the period of unrest in December 2017”, with demonstrations across Iran over economic and political issues — and then condemns Sotoudeh for joining 14 other Iranian intellectuals in a February 2018 call for a referendum on public support for the regime. Four decades have passed since the establishment of the Islamic republic, a government whose obsession with Islamisation has left little room for republican ideals. The verdict then set out Sotoudeh’s “crime” for both representing anti-hijab demonstrators and for removing her own hijab in public. No Iranian court – pr Persian speaker for that matter – would ever confuse the headscarf, that covers the head, with hijab which is the practice of veiling. I challenge Iranwire to provide the original Persian text with the official stamp of the court. In 2009, Mohsen Makhmalbaf created a fake memo from the Interior Ministry claiming that Ahmadinejad had received only 5 million votes. I was also not aware that English is the official language of the Iranian judicial system.